Israel's official, state empowered religious establishment arouses disgust among Jewish Israeli couples considering marriage. This is due to the needless tribulations many couples experience at the hands of the Rabbinate on their paths to marriage, and due to their fear of being required to conduct their divorces via the State rabbinical courts. Israel's Chief Rabbinate and rabbinical courts are Judaism's greatest enemy. The irony is that the Chief Rabbinate is directly responsible for eroding the institution of family in Israel. Clearly, the Rabbinate's monopoly must be dissolved, as per the wishes of the majority of the Israeli public, which wants freedom of choice in marriage. Civil marriage must be instituted in Israel, and the weddings of all Jewish streams must be recognized by the State. According to data from Israel's Central Bureau of Statistics, 50,800 couples (of all faiths) got married in Israel in 2014. All of these were married in religious wedding ceremonies, which are the only ceremonies officially recognized by the State of Israel. These data do not include weddings that were not officially recognized by the State, nor civil marriages that were conducted abroad. The number of couples (of all faiths) that got married in Israel in 2014 was 3.6% lower than the number that got married in Israel in 2013, which was 52,700. This drop came DESPITE a 2% growth in Israel's population. 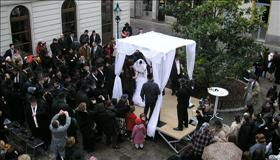 Hiddush's analysis revealed the greatest decrease in domestically performed wedding ceremonies was in the Jewish sector. The number of Muslim weddings actually increased by 5% (from 11,300 in 2013 to 11,900 in 2014). In contrast, the Jewish sector experienced a significant drop of 6.5% - from 39,400 to 36,900. Hiddush's analysis revealed the greatest decrease in domestically performed wedding ceremonies was in the Jewish sector. Israeli CBS data published in recent years indicates the main reason for the decline in Jewish marriages: a dramatic increase in the number of unmarried couples living together, which is relatively low compared to most of the western world. In 2012, there were 69,000 unmarried couples living together in Israel, and this number increased over two years to 88,000. During that same period, the number of unmarried Jewish couples living together in Israel jumped from 65,000 to 84,000 (an increase of 29%). This is a significant increase in the number of such couples, which increased from 5% to 6.1% of the Jewish population. However, the drop in the number of Israeli couples marrying overseas is more difficult to explain. One possible reason for this decrease is that such couples often report their marriages to the Ministry of the Interior more than a year after their weddings, and some do not register their marriages at all. A second reason may be that the total number of couples who registered their marriages with the Ministry of the Interior also fell during this period - from 9,500 to 8,800 in 2014, a total decrease of 7.5%. A large portion of these couples include those who, for various reasons, cannot officially get married in Israel - for example, Jews marrying non-Jews, or Jews marrying individuals registered by the Ministry of the Interior as "having no religion," including some 350,000 immigrants from the Former Soviet Union whose fathers are Jewish, but whose mothers are not. Hiddush's regular, periodic polling consistently proves that the number of Israeli couples who desire to break free of the Rabbinate’s shackles is rapidly increasing, parallel to a growing level of disgust with the coalition’s political horse-trading, which comes at the expense of religious freedom. In 2015, 80% of secular Israeli Jews responded that they would not have had Orthodox weddings if they had been given other alternatives. This was a dramatic increase from 67% during the summer of 2013. Nearly half of the Jewish public (49%) responded that they would marry outside of the rabbinate, given the option. This was also a significant increase from 39% in 2013 and 35% in 2009.